Blank Page Muse: The Clock Struck 12 with Tamiko! Happy Friday folks, it's Tamiko here! So many have done fairy related pieces and to tell the truth I have been a little jealous. I have found a way to make up for it though! Who doesn't like a good fairy tale? I know I do to this day! Having an almost 10 year old doesn't automatically give me the get out of fairy tale free card either, but you know what, I'm cool with that. So today I present my take on on Cinderella.. from my journal. I began doing a rough sketch of where I wanted everything to be in my journal which gives me plenty of room for play! I then coated both pages with clear gesso. Liquitex is gritty, it adds a lot of tooth to the page which is a good thing when you expect it. 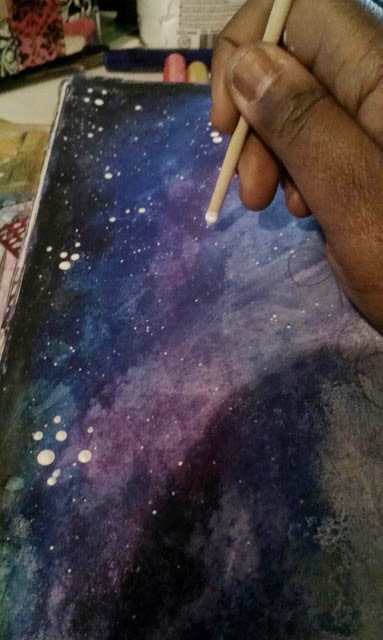 I also scribbled with my gelatos in various colors to create a night sky, using shades of blues and purples. I also gave my page an inked edge look with the gelato in black. When I apply my gelatos, I find that that the key is to dip them in water. 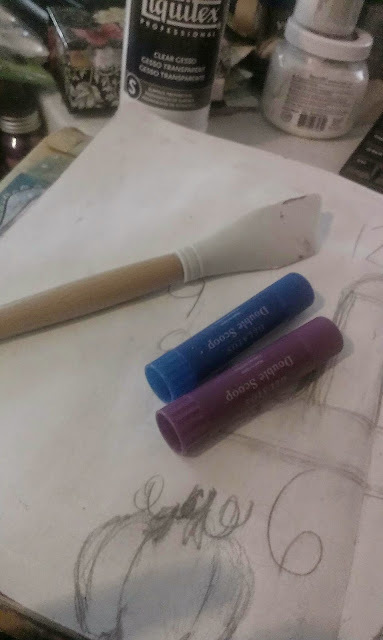 You can also use baby wipes to move the color, but then I always wet my fingertip... it leaves a more lineless blend. Took some Titanium white fluid acrylic by Deco Art's Media line and used the handle of my brush to do dots which in turn look like stars. Did some loose line work around them with my white gel pen. I did most of my drawing and added some smaller details to the floor with the Pattern 2 stencil. I only used the inner concaved diamond shape to create a patterned floor with my Pitt pen. 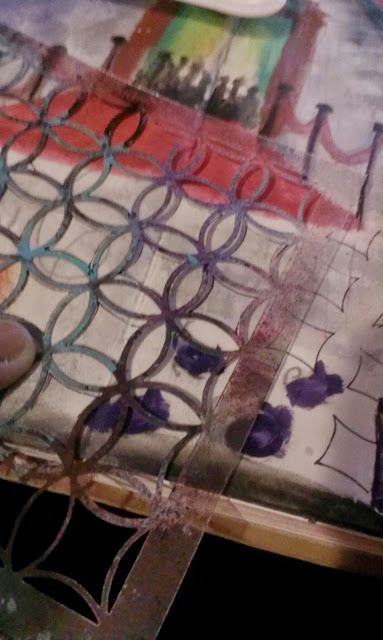 I later painted around the shapes with a metallic gelato watercolor wash.
Then I took my stamps from the Clockworks plate and stamped them on on the page with Stazon ink. 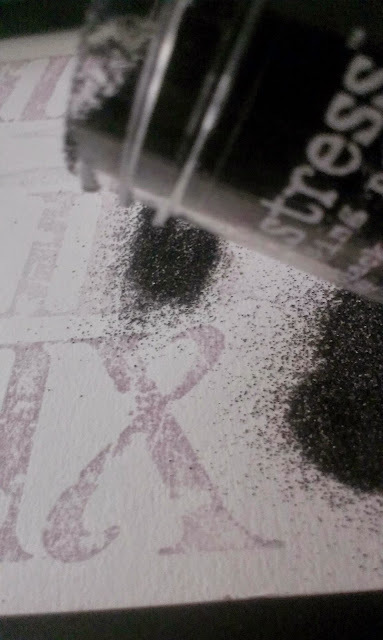 That ink once dry doesn't smear or come off if wet again. I stamped there to give the background some texture. 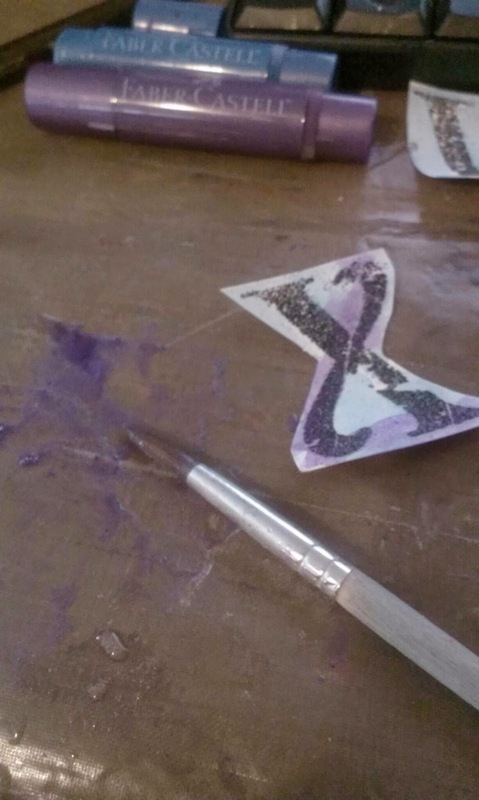 Then I took those stamps and stamped versamark ink to water color paper. 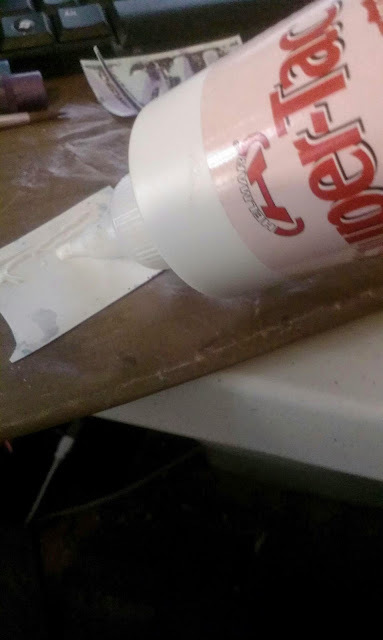 The ink from the stamps came off with the versamark, but it didn't matter, you won't see that color in a moment! 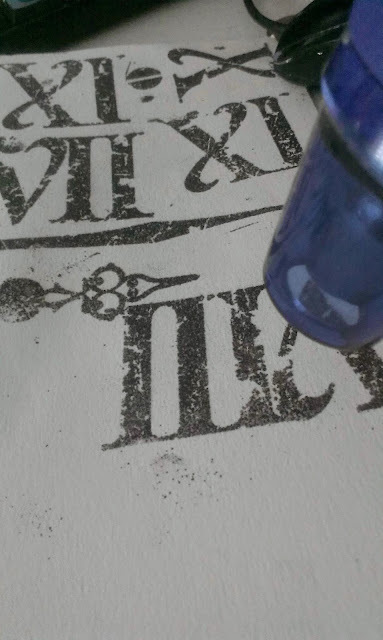 The Ranger embossing powder was sprinkled generously over the juicy stamped images of the roman numerals. Shook off the access and hit it with the heat gun. I then took the images cut away some of the excess paper and added a little color by creating a water color wash with my squished metallic gelatos that I sprayed with water, and brushed the water color paper and over the embossed image. Added some good old Helmars Super-Tac to the backside, for a QUICK hold to my page. Used some Faber Castell Glass bead glitter to the shoes and dress because don't all princesses sparkle? Especially if it's for ONLY a few hours? Stamped some swirly doos from a stamp from the Bingo Plate set to the dress for pattern and texture. 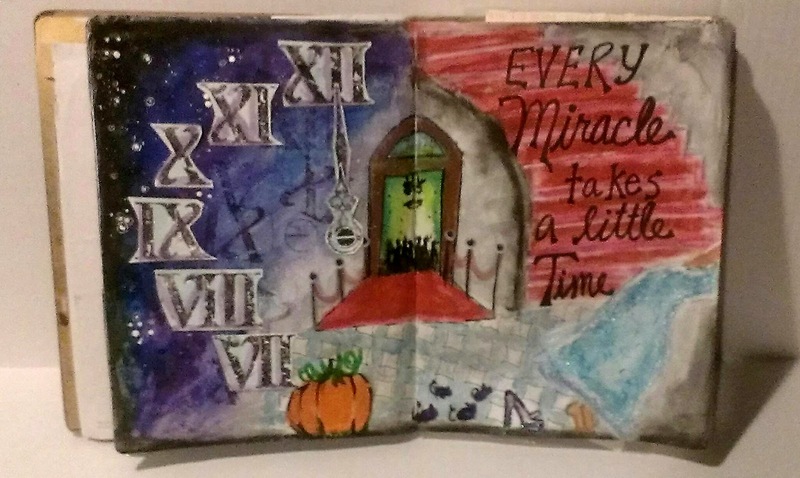 I LOVE your journal page and the way you used the roman numerals is fabulous! You are so creative..::sprinkling fairy dust on you:: and waving hi from the hills of North Carolina! Fun! What a great page. Cool techniques! Love you page and my favorite fairy tale. 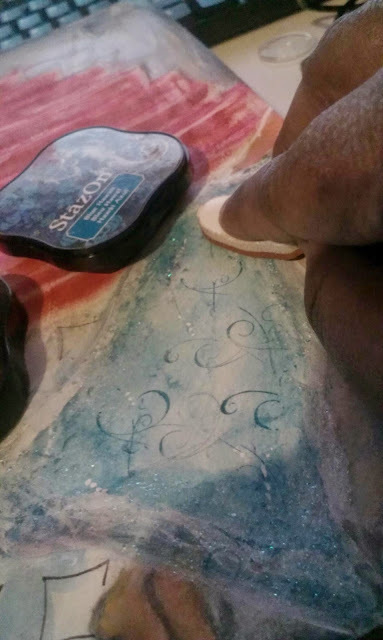 Leaving some fairy dust on your blog. So many elements on your page and you combined them all so well.. I love the white dots from the DecoArt white paint they so look like stars in your background.. Those numerals look terrific layered in the background then on top in the black embossing.. Your pages are just wonderful.. 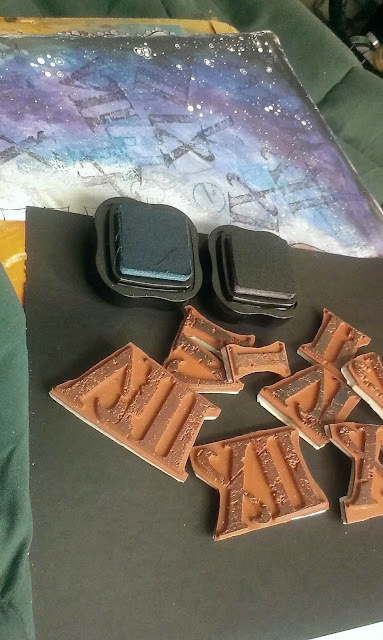 Clever use of that stencil for the bricks making me look at the shaped ones I have a lot harder now. Great fairy tale page! Love those deep colors!